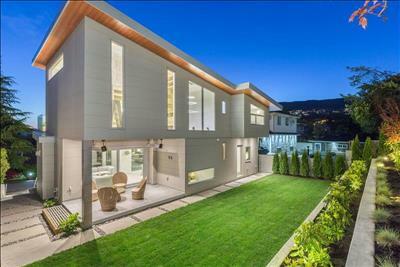 The home is beautifully designed with an expansive main level featuring floor to ceiling windows and a wonderful walk out view-side terrace that enjoy a covered outdoor lounge area, fireplace and a heated infinity jetted spa … all while looking out upon stunning ocean views. A fabulous Living and separate Dining area are perfectly designed for entertaining with direct access to the terrace area and all while featuring marble detailing and wonderful hardwood floors creating a sophisticated and luxurious effect. 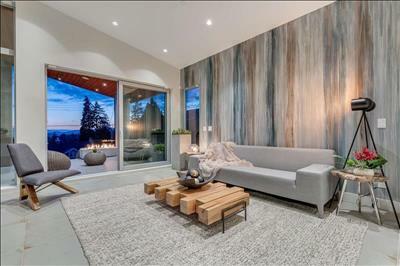 An impressive gourmet kitchen with expansive center island and all top grade stainless steel appliances sits adjacent to a spacious eating area and adjoining family room with built in flat screen and fireplace. Additional rooms on the lower floor include a large media room, recreation and games room, wine cellar and Guest Bedroom. Above, three generous bedrooms including a sensational Master Suite, walk-in dressing room and five piece en-suited bathroom. The exceptional quality and attention to detail is evident throughout the entire home and must be seen to be appreciated. Custom European stone and tile throughout. Japanese Nichiha and aluminum siding, metal roof, RTI home automation & security system, radiant heating and wine room are just some of the unique features of this beautiful home.